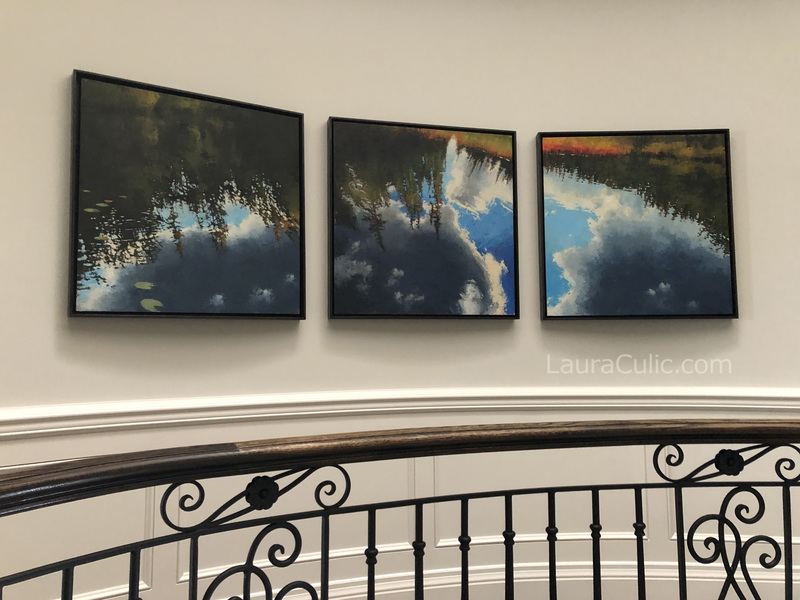 The centre painting was purchased initially, and the happy clients decided to commission artist Laura Culic to create the accompanying two as a triptych to enhance this unique, high‐visibility location in their beautiful Toronto home. Where does the wax come in to the process? Cold wax is a oil painting medium that is a buttery soft paste made from beeswax, resin and solvent. It is mixed directly into the oil paint on the palette, and the mixture is usually applied with various tools to the painting surface. Cold wax does several things: it speeds up drying time; increases the body of the paint; increases the translucency of the paint, and allows layers to be built up and scraped off again, to reveal underlying colours and to create texture. How durable are cold wax or encaustic paintings? Will they melt? Both cold wax and encaustic paintings are extremely durable. Beeswax is a natural preservative. Neither cold wax or encaustic paintings will melt. Some clients have my work hanging over their fireplace, with no adverse affects. As with any form of original fine art, cold wax and encaustic paintings should not be hung in a location that has prolonged direct sunlight. This is a very frequently asked question that is difficult to answer. I work on several paintings at a time, in rotation, and some are resolved more quickly than others. Some paintings present greater challenges, and some are put aside indefinitely. Often the answer to a problem with one piece is resolved by working on another one. Painting is a full‐time job for me which requires daily application. It is a roller coaster between the euphoria of surety and wild abandon to the difficulties of setbacks and doubt, and then back again. I permit clients to take work home on approval. Usually arrangements can be made so clients may try out a piece for a period, to make sure it works in their own environment. It’s very important to me that clients are completely happy and certain about the work they choose. The art galleries that represent me all offer this service as well. I am happy to accept commissions from clients. 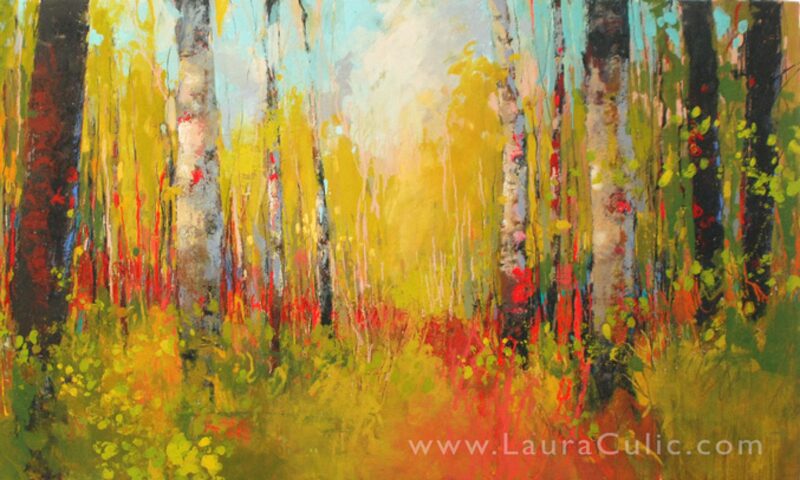 I can paint a new version of a sold painting, or a custom size version. Commissioned paintings are never “replicas” of existing work — they are similar, but always unique in their own right. How can I be sure what size of painting will work in my space? I recommend that clients tape a piece of coloured paper up in the space they are thinking of, and live with it for a bit, to get an idea of what size works best. I have noticed that often, a painting can be larger than the client might initially have imagined. Why are the paintings on wood panels? I paint on panels made of acrylic primed, braced Baltic birch ply, that are usually 1 1/2″ deep. Both cold wax and encaustic require a rigid substrate as the medium might crack on a flexible surface. My technique is quite vigorous, so the “give” of canvas would not be suitable, and the scraping and scoring that I do would not work on canvas either.